I “met” Brian Colin (creative lead writer for Atmar’s Cardography) at Origins Game Fair 2018. As we talked, he asked if I was from Georgia and, after some questions, it turned out we knew each out from comic books 10 or 12 years prior. Both of us had tried our hands at them and since moved on until we reconnected in Ohio because of gaming. After talking for a bit, I picked up a deck of his dungeon building cards and, when I learned about the Kickstarter, I knew I had to cover it. EGG EMBRY – Brian, I appreciate you taking the time to answer these questions. What no one would know if I didn’t say something is that you’re answering these the morning of Dragon*Con (where you’re displaying with Norse Foundry). So, thanks for taking the time to do this. BRIAN COLIN – Thanks for having me Egg! Even as busy as the con-life is, I will always do my best to freeze time and talk about the projects I’ve got going on. EGG – Let’s start with the obvious question – What is Atmar’s Cardography: Full RPG Modules & Random Dungeon Decks? BRIAN COLIN – Cardography is a dungeon crawl adventure module where the map is built as a deck of playing cards. These cards can then be easily laid out as a full 52 card map, or they can be randomly picked to make a new dungeon of your own build. We currently have 2 versions printed, with 3 more that recently funded on a Kickstarter campaign that ends on September 18. 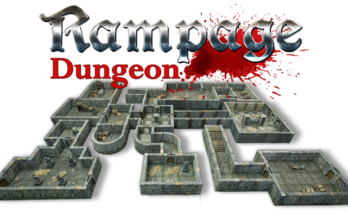 Each one has downloadable pdfs of full adventure modules for both Fate and D&D 5e. The “Atmar” part of it is based on the specific Cardographer, as he has chronicled the different regions of my world Revilo. The modules for each of these 5 decks are filled with unique creatures, magic items, and NPCs that you won’t find anywhere else because they are based off the fantasy world I have created around my sculptures. EGG – I picked up a deck of Atmar’s Cardography: Break Through the Icy Divide at Origins Game Fair 2018. I really like these cards! Let me do a brief review – This deck is 52 cards laying out an ice dungeon with numbers denoting locations and encounters, and a foldout booklet that lists what each number represents. With 52 interlocking cards, this elegant system lets you display a huge, random dungeon even at a small table. While not sized for miniatures, it is perfect for (mostly) theater of the mind dungeon crawls. With that, why did you decide on playing card-sized components instead of something larger? BRIAN COLIN – First off, thanks for picking it up. I’m so glad you dig them. Drew from Norse Foundry and I were bouncing around ideas for projects we could team up on. We had settled into discussing things that could work in a deck of cards. The cost to produce isn’t nearly as expensive as a book, or other rpg products. Somewhere in the discussion, the idea of putting a dungeon in a deck hit me. With some of my early sketches, I tried sizing the squares to fit miniatures, but the cards themselves became very limited in appearance due to the size constraints. One of my favorite boxed sets from my youth was the Ruins of Undermountain. I wanted these decks to feel like they have that much adventure potential in them, so each card had to fit more on it. By that point, I knew they had to stay card sized. I wanted people to be able to easily carry them around to have a quick adventure on the fly, and the size/weight of a card deck really makes that possible. EGG – Each deck includes a short objective/adventure. It’s minimal yet enough for any GM to run an adventure. When does the adventure end, at the end of the 52 cards or at another point? BRIAN COLIN – That booklet with a short description is only the beginning. At the end of that booklet, there is a link to download a full adventure module with amazing content that I didn’t come up with alone. These adventures would not be the quests that they are if I didn’t have the amazing team of Kerry Colin, Isaac Skaggs, Nelson Spratt, Carey Drake, and Doug Vehovec working on them with me. 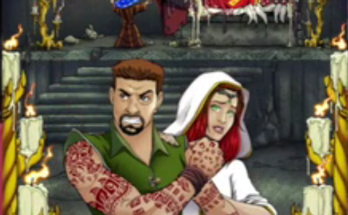 Each module has specific story hooks for player characters. 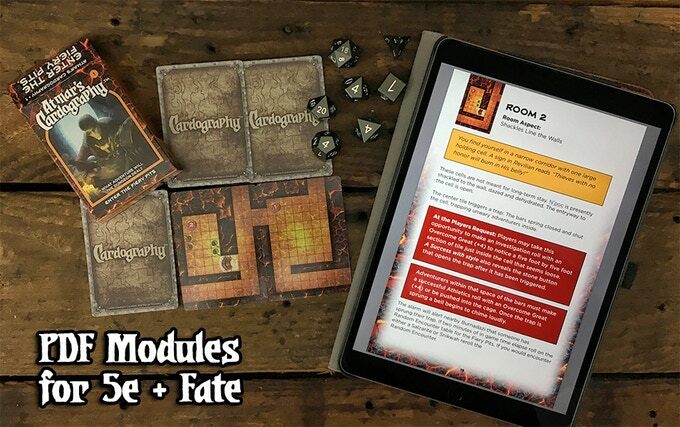 The rooms are broken down with narrative for GMs to read aloud to players, mechanical information for dice rolls, and additional content to help GMs make the most of the room. The adventure really ends when the characters resolve their player hooks. EGG – How much replay value do these decks have? BRIAN COLIN – Because you can shuffle the deck and create a random dungeon, I think the possibilities are pretty endless. You can include content from the modules, or put whatever you want in each room. You can even just use the cards to inspire your own dungeon creations. The only limit really is your imagination. EGG – You’ve shared some decks at Origins and Gen Con. What’s been the reaction? BRIAN COLIN – So far it has been pretty amazing. Folks have really seemed to like the concept, and the Fate games I ran at both cons using Cardography went over really well. At the booth, the dungeon deck part tells that part of the story itself, but we need to come up with some additional visuals to show the modules that come with each deck. When I start showing people the modules on my tablet it really sinks in how much you get for what we are charging. EGG – You have five decks available through the Kickstarter, what are they? BRIAN COLIN – The new decks are: Beneath the Forest of the Dead, Tunneling the Wajue Mines, and Survive the Badlands. We also have the first two decks, Enter the Fiery Pits and Break Through the Icy Divide available because they didn’t get a wide release from our test run. We’ve already unlocked the Monster Deck which includes the different creatures from the 5 modules. We are also really close to unlocking the Magic Items & Artifacts deck. EGG – This is for Fate and 5e. Why those systems? BRIAN COLIN – I had to do Fate because that is my game of choice. We also wanted to do 5e because it is a great system and so many of our friends play it. We would probably do more systems if we had the time and resources to put behind it. EGG – This is not a standalone product, it’s a part of your world, correct? Tell us about it. BRIAN COLIN – Yes, this is a way for me to slowly introduce people to my world Revilo. I created my world almost 9 years ago right before my son was born. I had just sculpted my first life-sized taxidermy style monster head and he needed a story. I decided that particular species would live in a world called Revilo (my son’s middle name Oliver backwards). I wanted to create a world we could collaborate on together. As the years have past I have sculpted over 50 species for the world, with help from my son’s ideas and drawings. He’s also helped with the pantheon of gods and even some of the room contents for Break Through the Icy Divide deck. Along with the sculptures I also have a bestiary-style art book called Revilo: Creature Collection Volume 1 that showcases and explains the different regions of Revilo along with many of my beasts. EGG – How did Atmar’s Cardography end up at the Norse Foundry? 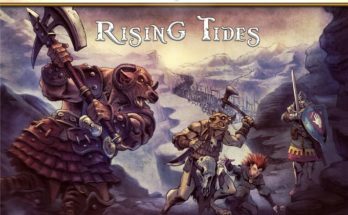 BRIAN COLIN – Norse Foundry is the publisher of my book that I just mentioned. Drew and I met a few years ago at a dinner during Gen Con. Our paths continued crossing at conventions where we would be out with the same group for dinner. I found out he was going to be getting into publishing and I was already working on the book, so we worked on that as our first project. We realized pretty quickly that if we teamed up we could create some really great experiences for our fellow gamers. EGG – This is not the only thing you do, tell us about Creature Curation. BRIAN COLIN – Creature Curation is my company that is really starting to grow because of Cardography. Originally I founded the company because I knew I wanted to make something bigger than just my art. It couldn’t just be my name. I am a huge believer in following your dreams and passions. I want to be able to help other people do that as well. Even though Revilo was a world where most of my creativity was going into, I didn’t want to limit the company to just that either. So Creature Curation has become the parent company of what I hope will become a growing line of games, accessories, and products that I believe in and would use myself. 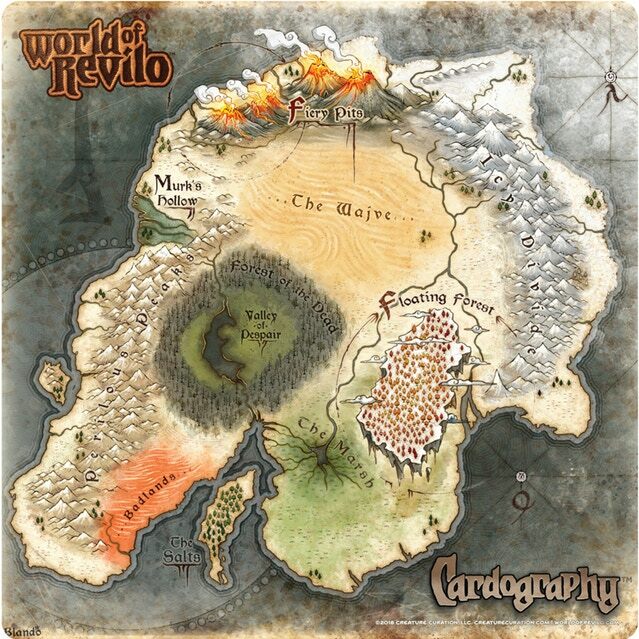 So far we’ve created RPG Pins & Patches, World of Revilo, and Cardography. The team that I mentioned above are all people that have invested time and energy to bringing projects we are passionate about to life, and we plan to create many more. EGG – I think I’ve eaten enough of your time. Enjoy Dragon*Con! But, before you go, where can fans learn more about you and your Kickstarter? Anything else can be found at creaturecuration.com or @thebriancolin on the Twitter. I hope your day is filled with adventure!